Red, swollen gums are a red flag for one thing: gum disease. If you have the symptoms, you’re not alone. 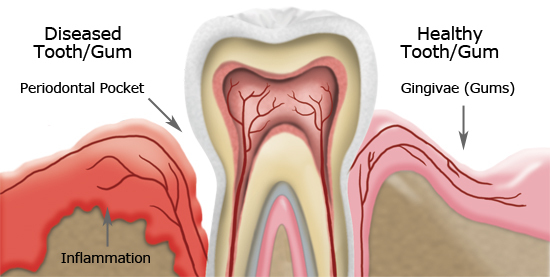 More than 80% of adults have some form of gum disease. Fortunately, there are many effective and painless gum disease treatments. For gingivitis, the mildest form of gum disease, dental care treatment typically involves a thorough dental cleaning, followed by daily brushing and flossing. Advanced gum disease, also known as periodontitis, requires scaling and root planning to remove stubborn deposits below the gum line. Laser gum surgery, a new alternative to scaling and root planning, uses beams of high-speed light to remove plaque and tartar buildup. If non-surgical methods of gum disease treatment are ineffective, a gingivectomy, or periodontal surgery, may be necessary. The main cause of gum disease is the bacteria found in plaque, but dental habits, medication, diseases and genetics can all play a part. If you needed another reason to stop smoking, your oral health may be it. Tobacco use increases your risk of gum disease, but breaking the habit can bring it back under control. Stress, grinding your teeth, poor nutrition and fluctuating hormones caused by pregnancy can all affect the health of your gums, as well. It’s important to work with a quality dentist, who can help pinpoint the cause of your gum concerns and guide you in maintaining your periodontal health. Along with your routine dental checkups, Dr. Haroonian and our hygienist will check for any signs of gum disease and give you the right recommendation of gum treatment if necessary. Contact us today to schedule your dental checkup in Newport Beach.